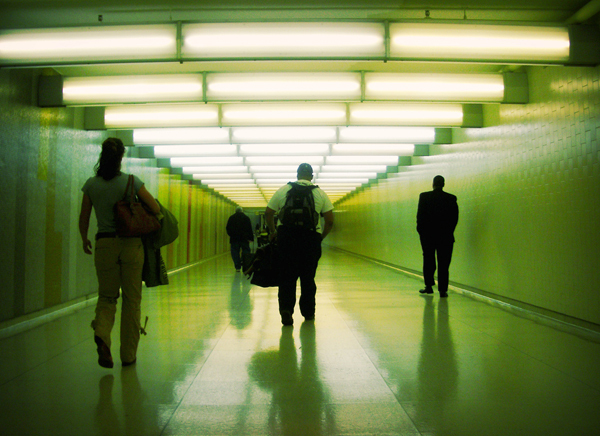 I found this photo on Flickr of one of those long, character-less hallways at Los Angeles International Airport. The image was taken in 2006 with a Pentax Optio point-and-shoot and processed with Photoshop. As I’ve written before, I define “transit” loosely for our “art of transit” series — if a photo involves getting from Point A to Point B, I’ll consider it for this series. Oh, don’t call it one of those “long, character-less hallways”! I’m excited every time I come back to this terminal (T3, I think) and walk the long multi-colored retro mosaic that stretches all the way along the left wall. But the mosaics along the left side of these original LAX terminal tunnels are quite special. Actually, this hallway has more character than some of the “hidden passageways” I’ve seen at LAX. The connector passage between terminals 5 and 6, for example.